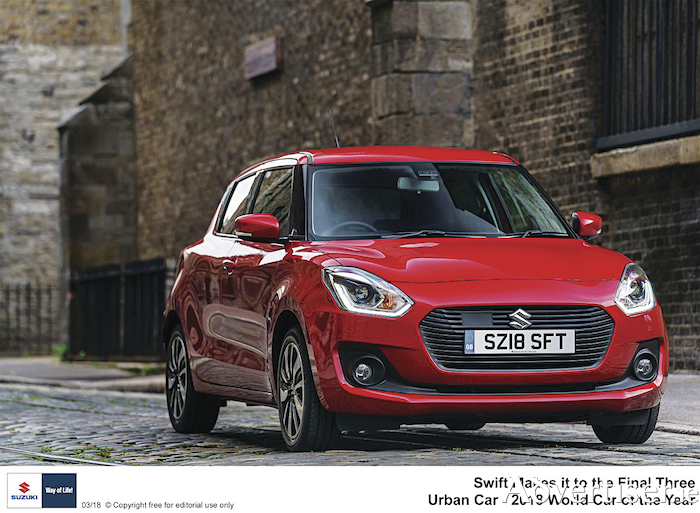 Suzuki tells us its Swift has made it to the top three in the world in the urban category of the 2018 World Car of The Year. It joins the Ford Fiesta and Volkswagen Polo. To qualify for the initial judging process, vehicles had to be less than four metres long, suitable in design for everyday use in an urban environmen,t and also on sale across two continents by the deadline of spring 2018. At 3.84 metres in length, the Suzuki Swift qualified and was shortlisted as a finalist in January of this year. The Swift is powered by either a 90PS 1.2-litre Dualjet petrol engine or a 1.0-litre Boosterjet turbocharged petrol engine with the 1.2-litre available with optional AllGrip four wheel drive. It also offers optional SHVS (Smart Hybrid Vehicle by Suzuki ) technology that lowers CO2 emissions to 97g/km. The SZ5 model offers the latest in safety technology which includes three advanced functions: dual sensor brakesupport (DCBS ), lane departure warning, and weaving alert.